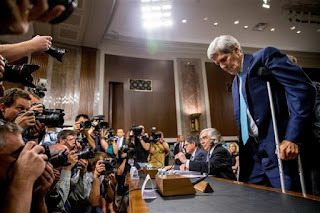 In an article in the Brookings Register recently, Representative Kristi Noem wrote, "A bad deal with Iran will jeopardize the security of America, the safety of our ally Israel, and peace around the world." She makes it clear in the article the agreement negotiated between the U.S., Russia, China, United Kingdom, France and Germany, and Iran, is a "bad deal" in her eyes. Excuse me, but I keep hearing almost every day, without fail, the security of the U.S. is jeopardized, as is the security of Israel, and there certainly isn't peace all around the world, even without the "bad deal." Honestly, can it get much worse, particularly in the Middle East? Now we have a new war erupting between Turkey and the Kurds. Leave it to the neocons in Washington and the whole region will be in flames, potentially nuclear in origin. I wonder if our Representative is aware of the enormous pressure being placed on European countries being flooded with refugees from the death and destruction in Syria? Is she aware of the continuing chaos and murder being perpetrated in Iraq as the fruit of our illegal and immoral intervention there? Is she aware of the way we are helping fuel the fires of war with our constant arming of countries like Saudi Arabia and Israel, while our drones produce new "terrorists" who have suffered the terror of drone warfare in places like Yemen? And will she take an honest look at the history of U.S. relations with Iran, including our overthrow of an Iranian government, the installation of the Shah, the weapons the Reagan administration gave them, the way we supported and encouraged the war between Iran and Iraq with enormous personnel losses in both countries? 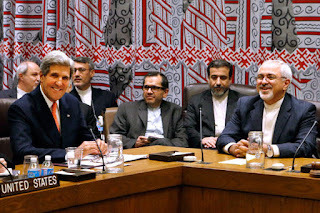 The U.S. relationship with Iran is spotty at best, criminal at worst. It's not exactly inaccurate for the Ayatollah Khamenei to call the U.S. "arrogant." I mean, here we are with stockpiles of nuclear weapons, refusing to acknowledge our ally Israel has them, and then telling Iran they can't make one. Then Representative Noem tells us Iranians in the background started chanting "death to America." 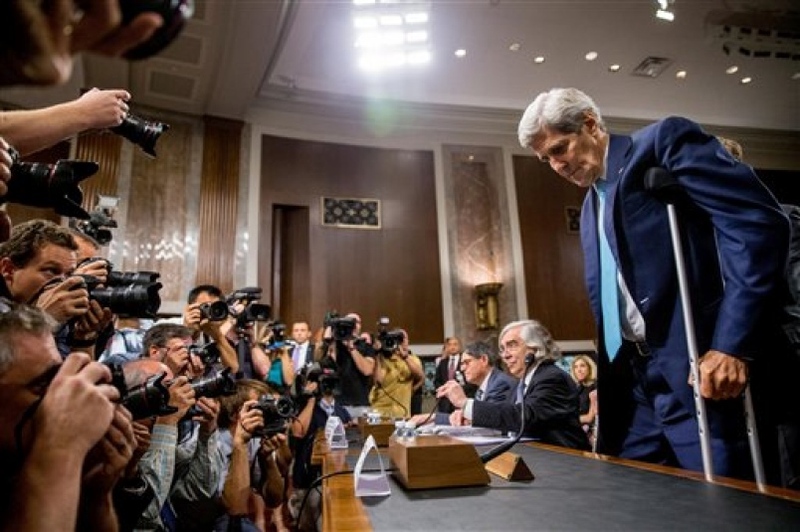 The reality is, there are hardliners in Iran just as there are in the U.S. Just watch the hearings with Secretary Kerry testifying about the agreement before the congressional committees. One guesses several of those congresspersons wouldn't care if every Iranian in the world lived or died. Many of the clips I saw after the "deal" was announced in Iran were of jubilant crowds, mostly young, in the streets of Tehran. Since I don't watch Fox News often I don't know for sure, but my guess would be that's where our Representative saw and heard death chants, not jubilant young. There are some powers at work behind the scenes on this issue. One is the fossil fuel companies. Already gas prices are lower than Exxon Mobil and Shell and the others would like them. There's a glut on the world market. If sanctions are taken off Iranian oil, it can only take prices even lower. It's already tough to cover the cost of mining Bakken crude in North Dakota and even harder to cover the cost of mining tar sands oil in Alberta. There's a lot of money invested in those oil fields and there's enormous political power in the fossil fuel industry that developed them. The other powers at work behind the scenes are those who have a vested interest in spreading fear. They include those in the security and weapons industries and media outlets beholden to ideological positions. Since when did this country decry diplomacy as an untenable option to international problems and opt first and finally for force? And aren't the toughest issues the ones we most want diplomacy to attempt? Much noise has been made around the issue of verification. Listen to the experts! Those charged with determining whether Iran will keep their word, with doing the inspections, are not troubled by a 24 day delay. Representative Noem is. Perhaps she needs some time with the inspectors to learn of the powers of aerial surveillance and the sensitive instruments used to detect radioactive substances even weeks after sites have been "cleansed." We've given warfare a chance and it's been a dismal failure. Al Qaeda morphs into ISIL morphs into …? 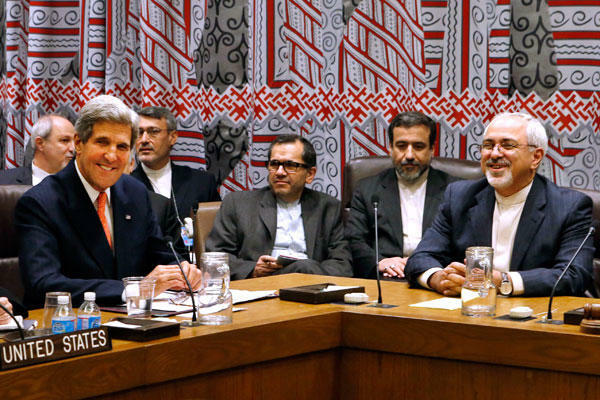 Time magazine reports that after signing this "bad deal," Iran is cutting it's ties to Hamas. And there is some suspicion Hamas may be courted by Saudi Arabia, the U.S. friend and supposed ally. Will that make Israel happy? Instead of unleashing more hatreds in this important and historic region of the world, we need even more intensive diplomacy. Give the State Department and diplomatic missions just one small fraction of the Pentagon's budget! And instead of promising more weapons to Israel and Saudi Arabia in exchange for their grudging acceptance of this nuclear deal, we should be working at undermining their insecurities with dialogue and the building of trust across the national, ethnic and religious barriers. War is much too easy for the impatient and comfortable, our national nature.